Whatever else William Shakespeare was he was a voracious reader. One thing is certain: there were a few books on his bookshelf that he referred to constantly and which were well thumbed. Among them were all the volumes of Raphael Holinshed’s Chronicles of England Scotland and Ireland, which was a comprehensive history of Britain. On the shelf beside that was Sir Thomas North’s translation of Plutarch’s Parallel Lives, biographies of famous Greeks and Romans. Both Holinshed and North were Elizabethans, both a few years older than Shakespeare, both with books published shortly before Shakespeare began to write for the theatre. Holinshed was an historian and North was a lawyer, soldier and translator. All of Shakespeare’s history plays, as well as some others, such as Macbeth, use the events described by Holinshed. Shakespeare took the events and crafted his history plays around them, inventing the language the characters used. In some cases, such as in Richard III, he moulded the protagonist into a form that has conditioned our view of Richard for centuries. In fact, the real Richard III was not the villain that Shakespeare made of him. His use of North’s translation of Plutarch was different. He not only took the events as depicted by Plutarch; he actually used North’s language, sometimes word for word, in the presentation of his characters. Plutarch lived from 45AD to about 125 so he could almost have known some of the famous people he wrote about. He was something like a modern journalist, going around interviewing people who had known them or had stories to tell about them. One of those he interviewed was the grandson of a cook who had worked for Marc Antony. His grandfather had told him about the way in which the cooks had to put a hog on a spit every minute of the evening so that whenever the unpredictable Antony called for food there would be one that was just perfect. One of the men Plutarch wrote about was the great military and political leader, Julius Caesar. Although the events in Julius Caesar by William Shakespeare are identical to Plutarch’s version, it is interesting to see how Shakespeare twisted things to change the character of Caesar so that in the interests of a drama for the stage Caesar would deserve to be assassinated. Shakespeare makes Caesar an invalid, deaf in one ear, disabled by fainting fits, envious of Cassius’ swimming power. He is a boaster; he is superstitious, concerned that people may think him afraid of anything, and while insisting on his firmness, is always wavering. He behaves incautiously, blind to the dangers that threaten him while others see them clearly. 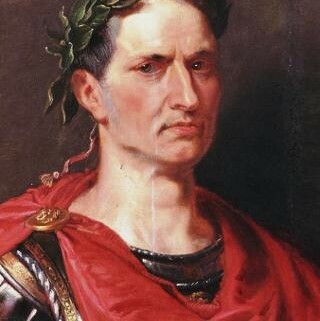 In Julius Caesar Shakespeare created another of his immortal characters, and we now think of Caesar as a very flawed man, which is not the picture painted by Plutarch. 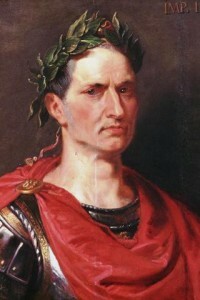 According to Plutarch in real life Caesar was a hero. In Shakespeare’s version his assassins insist that he has to die because he is too ambitious. But in real life Caesar was the saviour of a Rome in trouble and it was the assassins – Brutus, Cassius and the others – who were the villains: it was they who murdered him because of their own ambition. The Caesar of Plutarch had none of the weaknesses that Shakespeare gave him. Such is the power of Shakespeare that in the twenty-first century our perception of such figures as Richard III and Julius Caesar as wholly different from what they were really like persists. It would be very hard for us now to see either Richard III or Caesar in any other light.